I'm officially on Spring Break! !Although I have an alarm clock that still gets me up at 5:30....it's a good things she's so darn cute! ha! That's ok, because I have a SUPER busy spring break...and I'm starting it off by going for a run with my friend and ending up at the beach! Not a bad start to my spring break...doing what I love, with the people I love, WHERE I love to be! Anywho...just wanted to stop by and let you know that I added bookmarks for April! Head over to TpT to download this FREEBIE file (again, if you've been downloading them!) to get the April bookmarks I added. 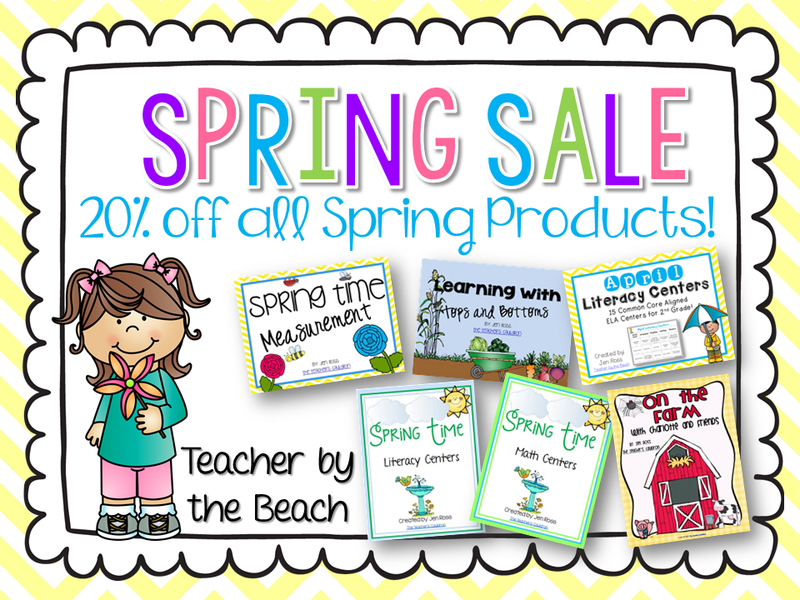 Also, I am celebrating the fact that I'm on Spring break with 20% off of my SPRING packs! 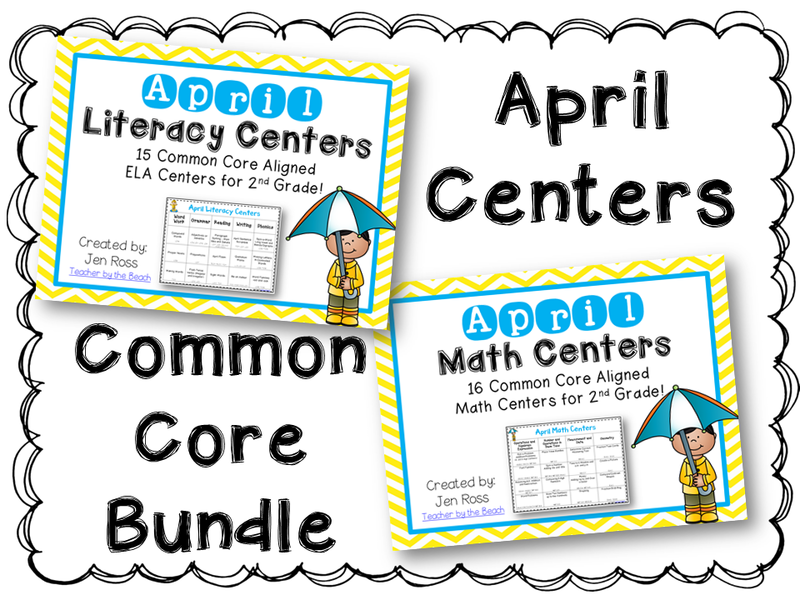 Just finished my April Common Core Math and BUNDLE! They're on sale too! Wish I could write something exciting. I stayed home for my spring break. Headed to sunny Florida on Monday! Yay! I also have 3 weeks til spring break....I don't know how we'll make it!! haha! I'm getting married June 28, so my Spring break will be FILLED with wedding appointments crafts and a SHOWER! It'll be busy, but a nice break from work! Our spring break doesn't start until April 17th and it is only two days due to all the snow/cold days off we've had. I'm hoping to sleep in (as long as I can get my kids to do that it'll work), and of course it will be an extra two days home with my kids. My Spring break is a week away. I teach in a different district from my own kids so I will be enjoying some alone time and can't wait!! Going to our family farm and cooking over the fire pit in the backyard ALL WEEK! My spring break is in April and I'm going to Mexico. I can't wait to sit on a beach and relax! Spring break was full of crossing things off my long list of to dos! Very productive! so cute! thanks for the freebie!! 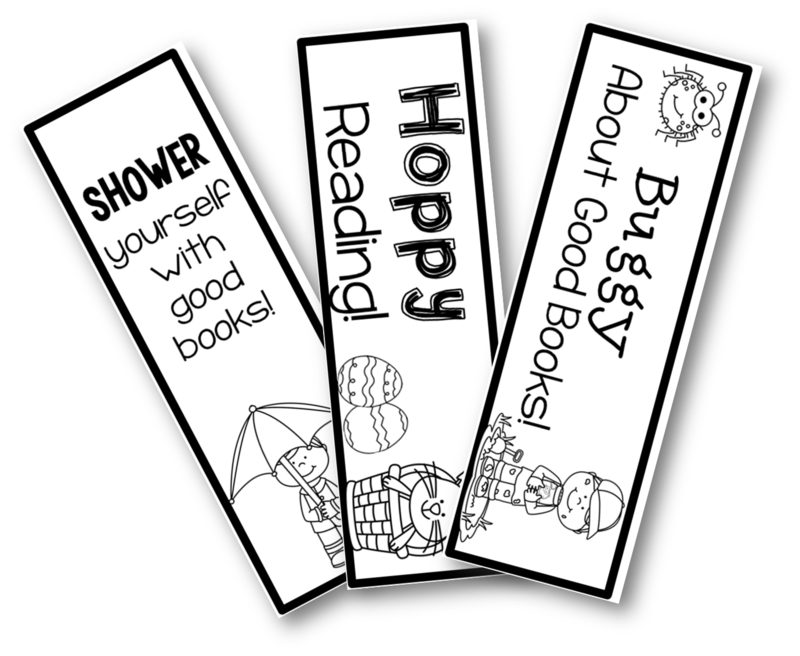 we totally need these, we are having a literacy faire (kind of like a science fair...) in a few weeks and were looking to print some cute bookmarks! thanks! I started spring break today and it is snowing after being beautiful all week. So, we are having family movie night with popcorn, m&ms and watching Frozen - so excited to spend some quality time with my family not worrying about school for a few days! Spring break is still two weeks away. I can't wait to rest and spend some time with my niece, Emma Rae! Three weeks 'til spring break. I'm just hoping the snow will be gone & the weather warmer - no real plans at this time. Spring Break isn't until April. I will be going to the mountains. I am on spring break now and I am going to sleep!!!! I am not on Spring Break yet, I still have one more week of parent/teacher conferences. When I am on break we are going to Vegas for a week ( time share) and using my Sea World passes and zoo passes to have fun with my daughter! My Spring Break is a few weeks away and I'm spending it having gum surgery! Yuck! During the first week, I went on a cruise with my family and during the second week, I did a lot of work in my classroom getting ready for the last quarter of school. Happy spring break, all! My spring break is in 3 weeks and we're planning on going to Cabo San Lucas!! I have 4 weeks to go until Spring break. If only I could afford it, I would love to go to Geneva, Switzerland to visit my 3 year old granddaughter and a grandson who is to be born in about 1 week! Guess I will have to visit through Skype! I plan to spend time with my family and do some cleaning and relaxing. I still have three weeks until spring break. I love to garden and I will putter in my flower beds. I will also spend some time with friends and family. I can't wait for spring break. I'm heading to Chicago to visit my sister and her family. I'm going to Sri Lanka with my family for the Spring break! Can't wait!! We don't get a spring break. I can't wait for April break so I can get back to planning my July wedding!! We don't get spring break until Easter but once we get there I'm painting the basement! I plan to relax and sleep....as much as I can with a bouncy boisterous ten month old! slept in, went hiking and took my daughter prom dress shopping!! Picking my grandsons up in Chicago and PLAYING all week! We flew home to be with family. It was wonderful! I will be flying to California where myself, my 3 siblings, and all of our spouses will all be together for the first time in 4 years! Lots of new little ones we all get to meet. I can't wait!